Development of fine and gross motor skills, increase in vocabulary and communication skills, exposure to math concepts, pre-writing activities, and handwriting, and Kindergarten preparation, are all goals of these programs. The school provides lunch and snacks, rest cots, art supplies, and other consumables. The parents are responsible for cot sheets and blankets, a change of clothes, and occasionally for unusual classroom supplies (ex. T-shirt for project, jars, paper towel tubes, etc.). The three to five-year old classrooms are set up in learning centers. These centers consist of art, dramatic play, manipulatives/math, blocks, reading, writing/computer, and science/sensory. The room set-up also allows for a cozy space where children can get away from the pressures of “group life”. The schedule is designed to provide a balance between structure and flexibility. The curriculum is based on theme units and incorporates everyday events as a basis for learning. For example, lunch-time provides the following learning opportunities: counting place settings to set the table, using proper hand washing techniques before the meal, learning good food habits through discussion of the lunch menu, observing good table manners during meal time, understanding proper social interaction while having lunch-time conversations with friends and teachers, being responsible by cleaning up spills and clearing the table, and following good health habits by brushing teeth and using the rest room prior to nap. The children in the three to five-year old programs are welcomed and involved in a pleasant social and academic atmosphere. Creativity is encouraged, and individual accomplishments are recognized and praised. Drawings advance from scribbles to distinguishable figures, children begin to form letters and shapes and recognize their written name and the names of classmates. Children learn to print their name, and to count. Each child enrolled in the program has a classroom folder. Communication from teachers and administrators, children’s artwork, and other items to go home are placed in the folder. It is important that this folder is checked daily to help keep you informed of your child’s activities and upcoming events. ​It is our goal to promote children to the next level as a class when the new school year begins. 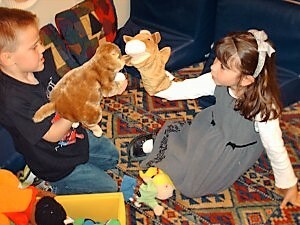 This allows children to continue friendships and to have the comfort of a familiar peer group. The three-year old ratio is 1:9, and the four-year old ratio is 1:12.